24" Rock Waterfall Garden Fountain w/ LED Lights: Perfect Garden Water Feature, Patio Fountain, Outdoor Fountain. Features Elegant Waterfall Flow | Fountain City Art Ctr. 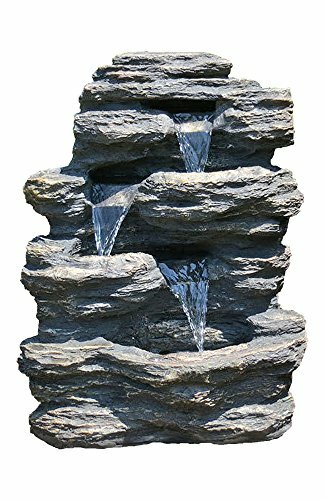 The 24" Rock Waterfall Fountain from Harmony Fountains is a great way to enhance the serenity of any outdoor home or garden space. Featuring a realistic layered rock design, this three tier waterfall flows like a calming natural stream. Also featured are brilliant LED lights nested in the pools for a stunning evening and nighttime glow. Give the gift of inspiration with this incredible fountain. Follow the included Quick Set up Instructions to complete water fountain set up in just minutes. Included is a quiet, powerful, adjustable-flow submersible water pump, combined with the 2 cool LEDs, that plugs into any regular single electrical outlet. Simply attach the easy-to-set up pump, fill the basin with water and plug it in to enjoy the serenity of cascading waterfalls. Harmony Fountains' designs are based in elements of nature with realistic polyresin that reflect environments from forested timberland, low grasslands, deserts, to high alpine peaks. Harmony Fountains endeavors to provide you with prime quality home, yard, and garden decor. We stand behind our brand and the quality of the items we sell with a money back guarantee. We will send new parts, or, as outlined in out product warranty, a replacement/refund if you're not absolutely thrilled with your fountain. ● Use the pump regulator to adjust flow to your liking. ● Check and tighten all electrical connectors at set up. ● Maintain water level so the pump remains fully submersed at all times. More arid climates may evaporate water sooner than humid environments. ● The submersible pump is constructed to screen out debris from the water and should be checked and cleaned periodically to maintain premium performance. ● To ensure proper flow of water over the feature, slightly adjust the horizontal level of the fountain as needed (shims). ● For longevity, drain, cover/store fountain during wintertime (freezing). If you have any questions about this product by Harmony Fountains, contact us by completing and submitting the form below. If you are looking for a specif part number, please include it with your message.